The 35th Moscow International Film Festival kicked off two weeks ago amid red-carpet fanfare, as well as the presence of a ravenous horde of undead flesh-eaters — and no, I’m not talking about the Russians. Summertime blockbuster World War Z, starring Brad Pitt, opened the Eastern European festival on June 20, drawing huge crowds gathering to see the leading man and his now-shoulder-length blonde mane. Funnily enough, Moscow would have featured prominently in the original ending of the apocalyptic thriller — which has earned the label as the most expensive zombie flick ever made — through an extended fight scene against the humanoid mutants in Red Square, according to Vanity Fair. But big-budget cinema isn’t the hallmark of this year’s MIFF, which, by the end of its run on June 29, boasted an eclectic mix of over 350 titles sourced from countries as diverse as Iran, South Korea, Brazil, France, Serbia, Kazakhstan and Turkey, among several others. Out of those, 16 — including three from Russia — were vying for the festival’s top prize, the Saint George trophy, a symbolic homage to the Russian coat of arms and its depiction of St. George’s storied dragon-slaying. As one of the oldest-ever film festivals, placing second only to Venice’s famed film forum, the MIFF holds a special place in motion-picture-viewing history. (The honor loses a bit of its luster when scrutinizing the broken chronology of the MIFF, which, after its inaugural event in 1935, didn’t reemerge until 1959 — by which time film-festival behemoths like those in Cannes, Berlin, Melbourne and San Francisco had all been established.) The former Soviet stronghold may be geographically distant, but that doesn’t mean we can’t partake in the cinematic excitement — scroll through our photo gallery below to revisit some of the memorable premieres and red-carpet glamour to come out of Moscow. Just don’t get stuck behind the Iron Curtain. Main Prize for Best Film (Golden George): Film director Erdem Tepegöz (Turkey) for Particle (Zerre). Special Jury Prize (Silver George): Film director Tatsushi Ômori (Japan) for The Ravine of Goodbye (Sayonara Keikoku). Best Director (Silver George): Jung Young-Heon (South Korea) for Lebanon Emotion (Le-ba-non Kam-jeong). Best Actor (Silver George): Aleksey Shevchenkov (Russia) for his role in Judas. Best Actress (Silver George): Jale Arikan (Turkey) for her role in Particle (Zerre). Best Documentary Film (Silver George): Paweł Łoziński (Poland) for Father and Son (Ojciec i Syn). Best Short Film: Film director Rustam Ilyasov (Russia) for Eleven Castle (Zamok Elfov). Special Prize for An Outstanding Contribution To The World Cinema: Costa-Gavras (Greece-France). Special Prize for The Outstanding Achievement In The Career Of Acting and Devotion To The Principles of K.Stanislavsky’s school: Kseniya Rappoport. 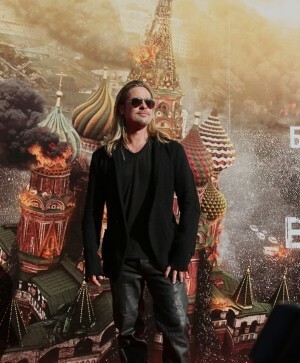 Featured image: Brad Pitt attends the Moscow International Film Festival on opening night. Photo Credit: Kristina Nikishina/Getty Images for Artefact.